Miodrag Kablinovic is founder of Miosuperhealth. A health and fitness related blog, which informs readers about nutrition and health. Plyometrics is a kind of exercise based on jumps and explosive movements. It's a very powerful training tool and should be used in all kinds of sports that require power. For the beginner, Jimmy Fusaro, master kickboxing trainer, recommends that you stick with single-leg hops. Stand on one leg, and literally jump up and down (hopping) while letting the other leg swing free. Do 30 seconds on each leg, alternating back and forth for a two-minute drill. Then rest a minute and repeat. Work up to three two-minute cycles. Now let's look at two basic punches and a kick. Remember that these are harder to describe on paper than they are to show in person. If you're serious about this sport, you will undoubtedly be working with a trainer or taking a class. The left jab is the "set-up" punch, the one that sets up all your power shots. Proper stance is important. 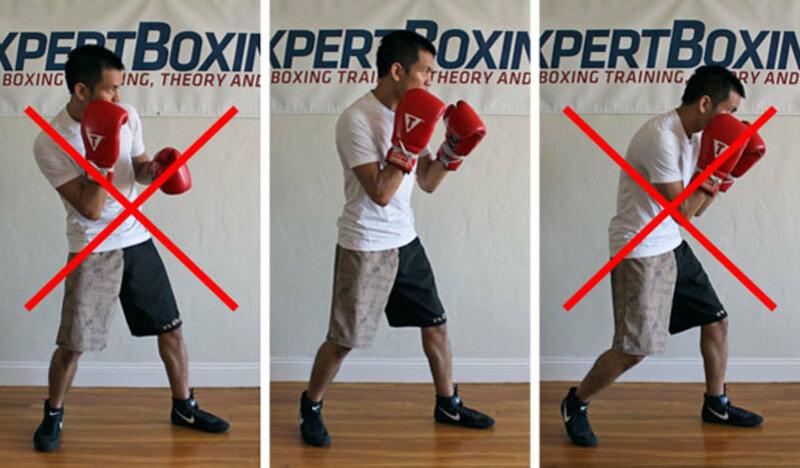 Stand in what's called "normal boxing stance" -- left foot forward, right foot back. Your left shoulder is forward and your right shoulder is back. Your hands are up, protecting the rib cage, and your fist is up protecting your chin. From this stance, shoot your left hand straight out (that's the jab). Hit the target and then comes straight back to starting position to protect the head. The left jab is followed by the right cross. This is your power shot. To execute it properly, the back foot pivots; the power and torque come from the hip. Your right hand comes straight out and hits the target and then comes straight back. A good basic kick to start with is the "rear leg roundhouse kick." Your front foot -- always the left -- pivots out, like you're putting out a cigarette. Swing the right leg and hip around so that if there were nothing there to connect with, you'd spin around in a complete circle. Your rear leg will hit the target (either a heavy bag or your opponent) and come right back to the original position. Now that we've covered some basic moves, let's talk about safety issues. According to Fusaro, the main issue to be aware of is joint snapping. Overuse of joints produces a great amount of wear and tear. Pay particular attention to the joints in your knees, which are called hinge joints. Similar to a screen door, which will eventually come off its hinges if opened and closed enough times, your knee joint can essentially snap if treated too roughly. Control your extensions rather than "snapping" them. If you're not very flexible, don't try to kick too high. Flexibility is king in a sport like kickboxing, and stretching is one of the most important things you can do. Finish your workout with yet another stretch session. Nothing will protect your muscles more. Lay on your back and wrap a rope or towel around one of your ankles. 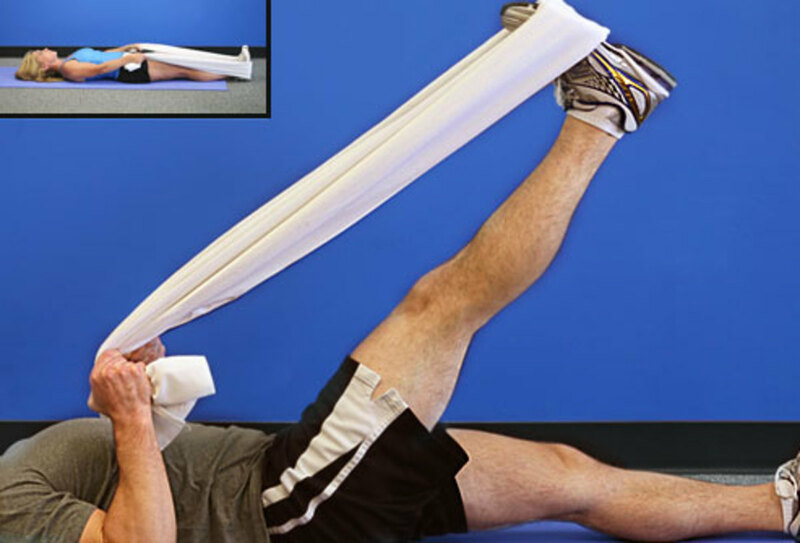 Then bring your leg up towards the ceiling, using the rope or towel to assist you, and attempt to straighten the knee until you feel a nice stretch in the hamstrings. 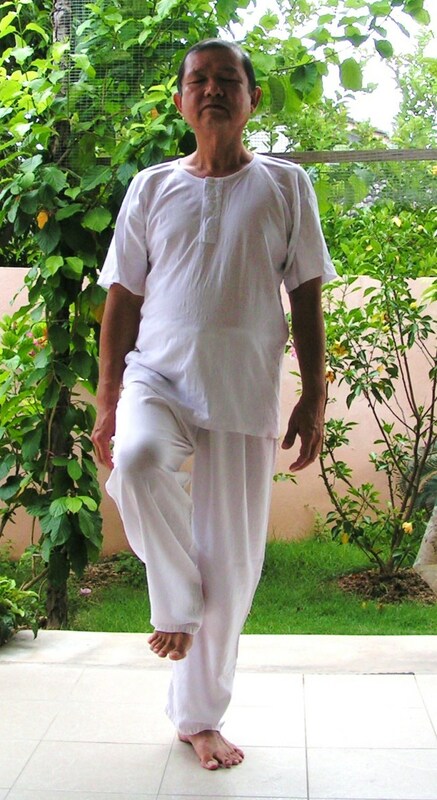 Hold the stretch for about two seconds, then lower the leg back down to the starting position. Now repeat, holding the stretch again for about two seconds and lowering it back to the start. Do eight to ten reps per leg. The idea here is to not hold the stretch long enough to activate the "stretch reflex," which causes the muscle to contract in rebellion. Instead, just hold it for a couple of seconds and then release, lower and repeat. It's very effective and, surprisingly, kind of fun. Remember that kickboxing can get you in the best shape of your life as fast as any other sporting activity around. Keep safety in the forefront of your consciousness, don't overdo, and be the best you can. And another reminder: There is no finish line. Have you ever tried Kickboxing?